How to create a blog that will generate increasing income! →How to create a blog that will generate increasing income! Not every blog makes money. But any blog can make money if given the right elements and anyone can start a blog any time. Many bloggers blog for many different reasons but most of us (bloggers) dream to generate some income in the activity. Unfortunately, this has always been difficult to achieve. There are many reasons bloggers fail to hit their targets. But I think everything revolves round the fact that they fail to treat blogging like a business. Like any other business, if you handle your blog with levity or not doing the right things, you are bound to fail. But how do you really create a blog that will constantly generate growing income? 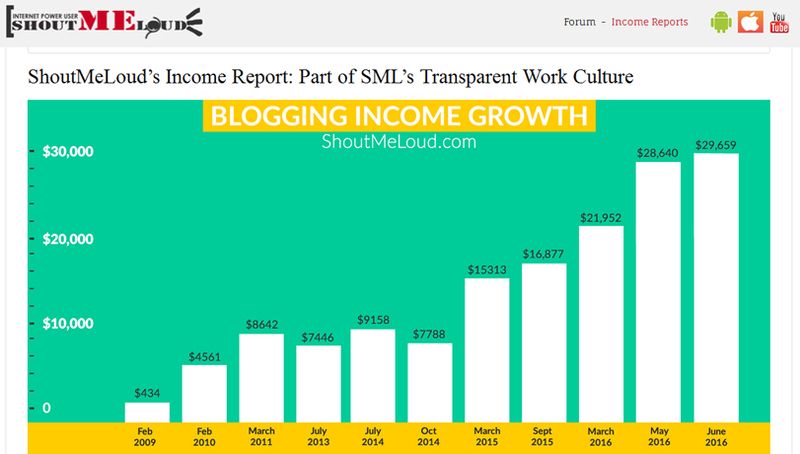 Some blogs generate income but are stagnant. For years, there is no growth in revenue. In some worst cases, the curve moves downward. Pat constantly publishes his income reports and this shows us how his earnings from his blog and blogging activities grow progressively. Every business aims at growth. Pat, Harsh and many more bloggers have proven to us that you can create a blog that makes more money month after month. Here are some tips to guide you. How to create a blog that makes more money month after month! Everything else starts from here! Any building that can stand the test of time and other negative environmental factors must strongly rely on its underlying foundation. A week foundation is a factor that favors failure. The topic or niche you choose to blog in is a serious factor that hugely determines the growth path of your blogging business. Many topics are seasonal and can quickly run into drought season. It’s important to turn to evergreen topics to be sure of fresh content anytime. While your passion is a strong factor, you must not forget that blogging is information. As you choose a topic you are passionate about, make sure you can always research and come up with consumable content. One of the misconceptions around is that you can always rely on the free world to grow your business. There are tons of free tools out there but most of these are not the right tools you need for your business. As a matter of fact, free is not always free. You end up getting less with free resources and this greatly slows down your business. Behind every successful blog is a successful blogger. Note that your brilliance or mediocrity will be reflected in whatever you do. As a matter of fact, most bloggers are failing or delaying their success simply by trying to figure things out themselves. But if you want real and progressive success, invest in training materials to acquire the right skills. The world today needs professionals and not half-baked cakes. Peter Sinclair shows us in this post how hiring a coach after many years in business meant a big turning point in his success. I imagine he would have had greater achievements if he got the coach earlier. A coach is someone who has attained a certain success level, having gone through different steps, and is able to show you the exact things to do in order to see same or bigger results. There are shortcuts in being mentored.If you want to go straight to the point and avoid wasting money on being scammed, hire a coach or invest in premium training platforms. Any blog that makes steady income has surely built and grown an active community with time. Your community is your marketplace. That means the larger your community, the larger your income. Your community members are readers who constantly read your blog and love your content. The trust your recommendations and act on your words. These are your friends, list subscribers, social media followers and feed subscribers. Growing your community is essential in maintaining a source of increasing passive income. That’s why you should constantly build a list, adding new members daily. Be active on social media so as to get more followers and friends. The world is constantly changing and new opportunities are popping to the surface every day. As a matter of fact, most successful bloggers are the ones who always publish first on new product releases. This gives you an edge over others in the market. For the most part, you’ll grab a nice position on Google page one. If you are doing affiliate marketing, your tracking cookie gets stored first in most browsers as your links get clicked first. This of course will ensure you get the commission before any one else promoting the same product. Google Alerts (content change detection and notification service) is a nice tool to get alerts each time something new comes up. Sign up to niche forums in your industry and join JV communities. These are places to get first-hand information on industry product announcements and updates. Blog monetizing methods have changed in recent times. While new methods have stepped in, old school money making models still generate results but with less efficiency. There are 15 and more ways bloggers make money. I don’t want to dwell on these now but I want to recommend you focus on one that will gradually build your blog into a money generating monster. This is a money making method that will never fade away. As a matter of fact, its strength grows day by day. The simple reason is that people need help to grow their business. So they are willing to pay you a commission if you help their businesses grow. Folks think they can just read random materials on the Internet and acquire the necessary skills in Affiliate Marketing. This might have worked for some but trust me, a majority who fail go down this path. My recommendation is that you get some sort of formal training. I have written a book on Affiliate Marketing for bloggers. I recommend grabbing a copy of my book. Another option is to sign up to affiliate marketing training platforms like Affilorama. The most exciting thing in affiliate marketing is to generate sales in products that pay commissions month after month. That’s one sure way to create and monetize a blog that generates increasing income. The more sales you generate on subscription platforms, the more your income grows month after month. You can do well promoting high converting products that pay once a sale is generated. Most bloggers who focus on this commission model see their income comes to a break once they stop driving traffic to the affiliate offers. But if you make it a rule to generate new affiliate sales on subscription platforms that pay commissions each time their clients are billed, trust me you will soon see a huge growth in monthly income. This will surely get you sales and affiliate commissions straight from your blog. One of the things most successful bloggers these days do is they create digital products that boost their earnings. A closer look at their income reports reveals how a huge portion of their income comes from their product sales. Creating digital products doesn’t have to be difficult. The first step is to determine which type of product to create. Jawad Khan discusses 3 types of digital products that are easy to start with. Once you have a hot product, it will be quite easy to promote as a blogger with an active community. Start with your immediate community and you will get quick sales. Next, recruit affiliates who will drive crazy traffic and generate more sales. Some platforms you may want to use to distribute your products include Gumroad, Clickbank, Shareasale, Dealguardian, etc. So those are some tips to create a blog that will generate increasing income. It’s not enough to make some money from your blog. It has to grow months after month and that depends on your strategy in place. Ensitne, This is an amazing post. At first when I got your email, I was hesitant to click the link over. You’ve really made some solid points here starting from laying a good foundation to becoming an author. All these points are fantastic, Getting premium tools, investing in yourself. I just wanted to add one thing to this last point. Investing in yourself is in many ways, Whilst most of us can’t afford a coach, There are better alternatives. In my own case online learning communities like Udemy and skillshare have been a lifesaver. Starting a blog is easy but standing it in this online world is way hard. Bloggers should know the perfect market and the niche they choose. Everyone loved money making and the ways you have mentioned above are worthy to follow. Reviews of the affiliate products can boost your income. Many people don’t invest on their website which tends them to get ruined. Enstine, I think the best advice and hardest to follow in the beginning is to invest in yourself and your blog. I think many start out thinking they don’t need to spend money to make it, but in business it is a MUST. It took me time to do that and I’m glad I have and I’m looking at other ways to do it coming up. It’s a slow curve both ways for me, spending it and making it. I’ve also learned to outsource a few things along the way too. It saves time and time is money! Thanks for sharing these tips and ideas with us Enstine. Your comment is spot on and thanks for the contribution. If we agree that no knowledge, we will always see the value in investing in oneself. I’ve always had a passion for blogging but didn’t exactly know how to go about it. And then the issue of continuity comes in(like time management along with full-time job and all). Having gone through this beautifully and well-written article, I am highly motivated. Thanks a million. Really if you are looking forward a blog that how to make money from blogging then you have across in the right place. You will get a lot of good resources from here. Really I haven’t written much blog posts but I have got good vibes from here. So will start very soon. I want to tell you one thing that through this blog I learned my shortcoming and my mistakes too. Thank you for putting your great effort..!!! Thanks for the comment and testimonial bro. That’s Very helpful and beneficial for beginners, I will share this helpful knowledge on my FB and Twitter Timeline. In this Article, I have got more ideas for Make a New Blog and Generate Income. Thanks for shared. Again you have crafted an amazing post and it’s really good to read it. And also the links you shared are worth reading. Robin Khokhar recently posted…11 Ways to Speed Up WordPress Blog and website? Well, setting up a new blog is not an easy task but one of the main features i could really suggest and is still trending is blog commenting. Not just commenting but must be a reasonable comment. Commenting is the easiest way to grow a blog and if done rightly, the results can really be quick and exciting. Great post…I agree that investing in yourself and in premium tools can make all the difference. You need to find a way to set yourself apart from other bloggers. Very correct, Mandy and thanks for the comment. I am a newbie in blogging, This excellent post is very useful for me. These tips will help a lot soon and I shared it at my FB. Thank you. All these bloggers show laying that solid foundation makes room for present and future profits. Generate income by positioning yourself. Have posture. Help. Offer free and premium content. Treat your blog like a business and more than anything, help, help and help some more to create your blog from a helpful space. Ah! sorry I’m replying late. Been jumping from here to there but… all is well. Everyone dream is to create a blog which provide me more and more income. They try different method to generate more traffic and income. shortcut in blogging for achieving their goal. then title and then theme these are more essential aspects of blogging then SEO. some of your points I really love to read, the community making point is the best that I have read all in to your great article. Hahah thanks for the comment and the point you made buddy. Wow….This is one of those posts that must be essential reading for all bloggers who are truly honest with themselves and admit that they need help to earn some money from their blogging activities. So many valid points and excellent links to invaluable information like Neil Patel’s article about how to start a profitable blog. Building a blog community for me is one of the real keys to success and our blogs should be a real “welcome mat” to every visitor we get. The more trusting relationships we can build, the greater our networking influence will be resulting in a much more valuable and profitable blog. Like you, I am convinced that affiliate marketing is one of the easiest ways to monetize our blogs but sadly way too many bloggers do not bother to learn HOW to be a profitable affiliate marketer. Way too many bloggers simply blast their ever dwindling number of readers with promotion after promotion without giving any value what so ever. No wonder 97% of new affiliate marketer fail. They need to change their mindset to being a “giver” first and to accept the fact that they need to learn the basic essentials of affiliate marketing as it’s most definitely NOT the overnight success venture that many newbie marketers think. As always just loved your awesome content Enstine and I’ll be sharing this post everywhere, including to my list. First, my apologies for being late and of course, I have not been active on your blog. It’s hectic here but I promise not to forget your home. A lot of free stuff that’s available on the Internet is on the other hand deceiving people who think they can just rely on them and see the kind of success others have. People need to get some sort of formal training. Yes some do succeed by gambling with free stuffs but, that just explains why a huge percentage fails. These are all sound ideas for generating income from your blog. I don’t think any one thing is “the best”… but it’s important to choose the ONE that suits your style and strengths. Make that ONE approach work before moving on to another. The #1 reason I see bloggers fail to generate income is that they are working on too many things simultaneously. That approach dooms you to failure. You only need ONE strategy for generating income, so choose that one and do it. You raised an important point I discussed in the past Donna and that’s focus. I believe in MIS but trying to build many things simultaneously is straight path to failure. Focusing on one thing gives you expertise and of course grows your income. Thanks for your input Donna. Five best methods earning an income online… unfortunately each method has its own barrier and nothing is easier than whichever method. It is a continuous learning process that everybody needs in their life. Another excellent post – thank you! As you have shown there are plenty of ways to make money with a blog. In fact, a blog need not necessarily be a money spinner in its own right. It could simply form part of an overall marketing plan. When I started my blog all I wanted was a platform to establish authority when I sent people to read my latest blog post. That’s all I did. In time I started to get some blog traffic too, which added to my weekly lead flow. For those who want to make money directly from a blog, they need to understand it is not a quick fix. Most blogs don’t make any money in the first couple of years. Sadly, they quit because they lose heart – the romance with their blog has ended. Good to see you here buddy. I apologize I’m late on this reply and haven’t been around you for long now. Things just got hectic but I’ll be back. Folks still don’t make a difference between blog and blogging. Just having a beautiful blog doesn’t mean you are blogging right. What generates income is blogging, not just the blog. Well these are some quality guidelines with the help of these one can grow our blogs. I have saw many of us didn’t focus the most significant part of blogging, means most of us are not choose the right topic which is also a biggest cause of failure in blogging. So, bloggers must always choose a topic in which they have enough experience and they are passionate about it. Another great article that presents the success recipe of online marketing in a way only you can: clear, concise and in easy to follow steps. You do not tell, teach or preach. You lead. Anyone who walks the road outlined in this article will sow the seeds of the success that can be achieved. Hard work, focus and commitment will help those seeds grow. Get a mentor, build a community and use the right tools to bring your house in order. Then give it your all and you are on your way. Great points. A post well worth sharing far and wide. I completely agree with you that we should focus on purpose as well as content while starting blogging. Cause a profitable blog is the one can really provide useful information. And if bloggers want to be successfully, they should invest their time and effort in their blogging to make value. Earning income from the blog needs consistent approach in developing above mentioned methods, I am blogging since 2 years and I was ON/OFF for some time and lost good connections. Harsh and Pat are really focused professional bloggers and they helped the blogger community a lot by providing useful content to the people. Thanks for sharing the information and reminding me the basics of blogging. Apart from having all these in mind, one has to love what he is doing and must not feel the burden to update the blog every once in a while. That’s the reason for success behind all these peoples blog. Love what you do and you will eventually succeed. I think working on your blogging skills, having a coach or mentor and blogging roadmap (planning how to manage blog in terms of content creation, promotion, etc) are the essential things to generate income from your blog. Blogging is not a one time task, it’s not like you start a blog and you start to earn money. You have to keep working on your skills and analyse your audience to get to know what you should do next to make your blog money making machine. I think newbie like me should follow these rules because these are the essential things in blogging that give us success in blogging. If we ignore that type of things then we can not get success in blogging. Alhamdulillah I am getting good success in blogging just because of following on these rules. thanks dear for sharing your knowledge with us. I have always had a passion for blogging but didn’t exactly know how to go about it.Generate income by positioning yourself. Have posture. Help. Offer free and premium content. thanks guidness for informative post.